Definition - What does Revolved Triangle Pose mean? Revolved triangle pose is a standing and twisting yoga posture that improves balance and flexibility. It can be used as a counter-pose to triangle or extended triangle pose. This pose is an opener for the shoulders, hips, lower back, hamstrings and spine. The twisting requires a strong sense of balance, coordination and flexibility. In revolved triangle, the legs remain straight and spread apart with one foot at a 90-degree angle. With both arms extended, the body bends toward the lead foot so that the opposite arm reaches toward the ground (right arm alongside left leg or vice versa) and the other toward the sky. Beginners who lack the flexibility or balance to master the pose may use a yoga block to support the arm reaching toward the ground. Revolved triangle pose is also referred to by its Sanskrit name, parivrtta trikonasana. 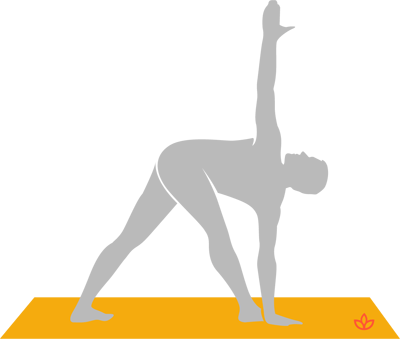 Revolved triangle pose is similar to revolved side angle pose, except that in the latter the lead leg is bent at a 90-degree angle, while revolved triangle pose maintains straight legs. It is also believed to relieve digestive problems, including constipation, as well as breathing problems such as asthma. Despite its benefits, revolved triangle pose should be avoided by anyone who suffers from migraines, insomnia or low blood pressure, or who has a back or spinal injury.